January 2016: Return to Pizza . . . a year later . . . the wheat has been harvested, a new pizza oven built and pizzas cooked, so the time has come to make the book. Working with colored markers I make storyboards of three-inch-square thumbnail sketches charting the progression of events. Since I began with the notion of clearing a field of weeds, and weeds are the subject of the woodcuts already completed (see Pizza – a work in progress) this will be my starting point. In these thumbnails I envision a portrait-format book, with tall narrow pages, that opens to form a square – a useful frame for pizza. The organic Glenn spring wheat came from Johnny's Select Seeds in Maine. Next, I chart the cultivation of heirloom Amish Paste tomatoes. 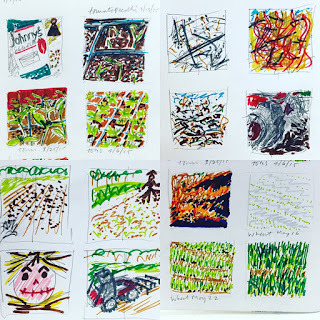 The tomato seeds were planted before the wheat, so if the book is to progress chronologically these images should be first.